Not sure why but sometimes documents will not print. When this happens I use PCL Pro. It always comes through for me. I’m technologically challenged but PCL pro helps me in a pinch. 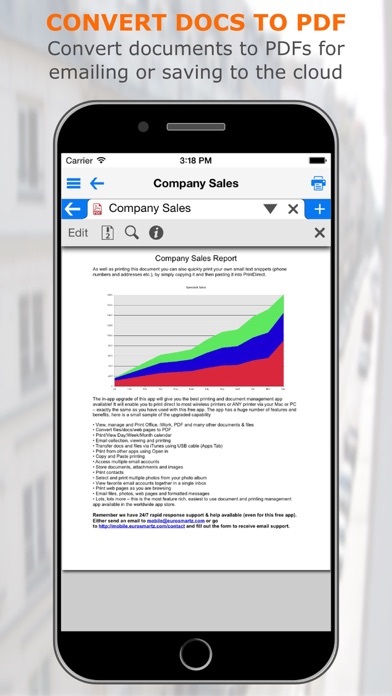 Great app for printing directly from my iPhone. I have a Wi-Fi HP printer, and this app makes it effortless to sync to it and print directly from my iPhone! This is a must have print it does it all!!! PCL Pro is the best App for printing from my Ipad and Ipod. It even beats Printcentral Pro (same company). The best printer,email,PDF app around. None better. Keep up the great work. Thank you. I’m really glad I got this app, I’ve tried others and always come back to Print Central Pro. I just does everything I need and does it well. I love reliability! Love it! Never had a problem. A must have for any printing needs. Just a little complicated when trying to sync with a windows 10 PC. This is the only app that I have found that works on every printer! Not just the eprinters. All printers, new printers every printer. Thank you, thank you, thank you! The ONLY app that does it all. Some complications but they are minor. Did not work for me. Found another way. Would love a refund. A primary element of printing from a phone would certainly be printing emails, but no. These guys WANT YOUR LOGIN DETAILS?? don't think so. Ethical vendors offer a freemium version to test compatibility. Not so here. Avoid avoid avoid. I am very pleased to be able to print wirelessly, directly from my iPhone and iPad, to my 16 year old LaserJet 6mp that's connected to an AirPort Express. This app made it possible. This actually worked!!! Took me a little while to get everything all figured out and working but it finally printed! I am using iPhone 6 plus and printing to a canon pixma mg3122 which was purchased back in 2012 and is NOT an AirPrint printer. So glad I didn't have to go buy a brand new printer to print from my iPhone! Thank you print central!! 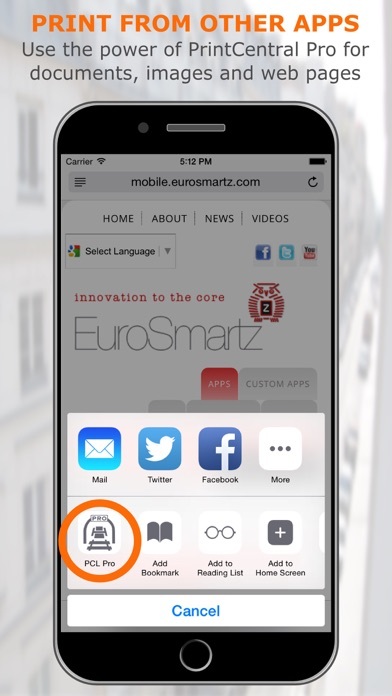 App is a great email and file manager on top of the print. This app lets me squeeze a few more years out of my old printer! Love it! This app was the only one I could find that Easily allowed me to print to my google cloud printer. I tried using google's own apps, but they had so many problems and were so clunky, I gave up on them. 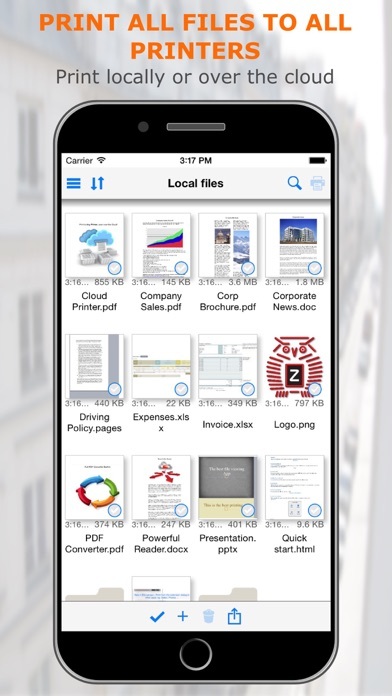 This application allows me to print virtually any documents, files or images that I can access on my iPhone. I can print them to the printers on my home network or on the network at my work. It works very well, has good tech support and is easy to use! Very much appreciate the ability to be able to print to my Brother printer from my iPhone. Thank you for making this app available. This is a great app. Helps me print seamlessly from my iPad and iPhone to both my home and office printers. Can't as for me! Does just what you need, and does it real easy, Great App! Wonderful app! Had it for a long time and it never lets me down. Great app. Works better than expected. So cool, now I can print on the go, from my house, from a field call sale. Very satisfied! I was considering buying an air printer. Couldn't believe my wireless Epson wasn't able to print from my phone. And now it can. I did not rate 5 stars because now and then it can't find the printer (Epson). Just to be clear, when it can't find the printer my MAC can. That phenom seems to be since getting iOS 6. Since iOS 8 (maybe 7) I have not been able to use this app with any success. It prints gibberish in some cases and in other cases (the supplied "help" document) it prints line numbers and the text as if it is printing code. User unfriendly. I'm ready to delete it and move on. Love, love, love, love this app. It's more intuitive then others I've tried, and I'm not blasted with a zillion hateful useless ads who's demented programmers think that if I buy one bottle of tidy-bowl, then I want to clean all the toilets in Yankee stadium. I have tried everything I know to print from my iPad and iPhone to my printer. Everything I tried did not work. This is amazing. Not only can I print from my iPhone to the printer, I can also transfer files from my iPhone to my PC. This has so many features I will never use. But to be able to print from my iPhone to the printer is awesome. This app failed to install with gmail. The app and the mac plugin is far to complicated to deal with. Waste if time. My go to iPhone printing app! I have tried many printing app's with my iPhone, but I always come back to PCL Pro ... it always works and works well. P. E. R. F. E C. T. !! Haven't really used it yet. Looks very useful. Only thing, according to Flipboard it was free. I had to pay. I bought it only because it looks useful. I have older Canon pixma 6120 printer & this is the ONLY App that worked (not even the Canon apps worked). Easy instructions & works great! Only software I've found that works with my old HP Officejet 7410. HP e-print app doesn't work as well. Highly recommended! 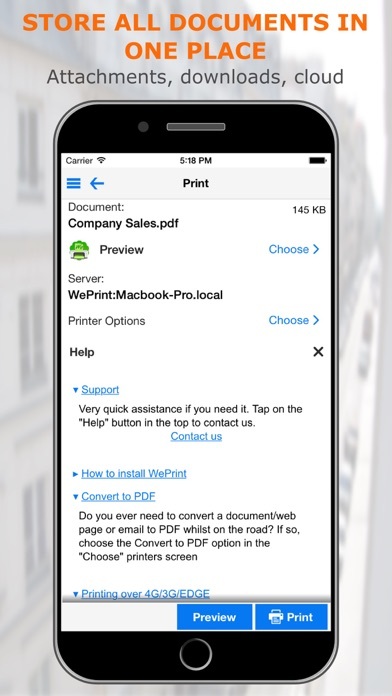 Super app that solves the problem of printing from an IPhone to a non airprint printer. I havent explored all of its capabilities yet but I'm looking forward to it. 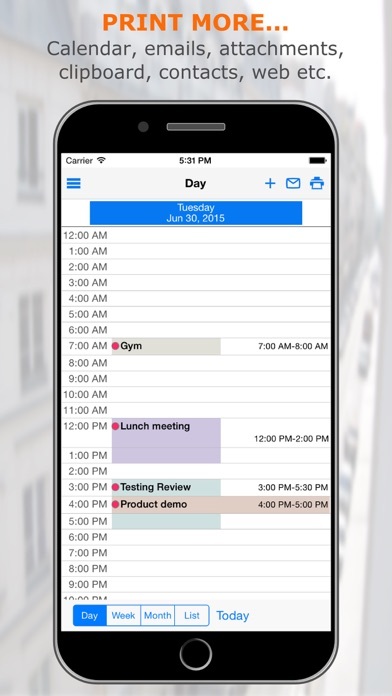 It's a must have app for Mac and iPhone users! Talk about fast! I've tried many many printer apps but this by far use the best. Absolutely loved it and highly recommend it! Never did get it to work. Waste of money. Why Apple took away the ability have custom printers so you could print to PDF from your iPhone, I'll never understand. Nevertheless, PrintCentral seemed like a good alternative. I used it before in its previous version. Now, it's useless, it seems. So, I want to print a receipt from a website. That's all. Can't do it from Safari. So, I open the URL in PrintCentral Pro, log back in to the website, navigate back to the receipt and click "Print." Nothing. The button doesn't work. Really? I'm in an app specifically written to print what iOS won't and the button doesn't work. So, I try the "Send to" button. Ah, yes, "Save as document." All it did was take a bloody screenshot. Really?? For this I paid $5.00 USD?? I could do that in Safari. Printing to PDF should allow exactly that--hit a "Print" button and get an option to save the printed output as a PDF. As it stands now, my experience of PrintCentral Pro is that it's useless and hardly worth any amount of money. App deleted from my phone. Bye. This app would not set up with my iPhone 6+ and Brother 3140. Printed repeated blank copies and then printer jammed. Guess I do not print from gmail on phone. Sorry but just a mess right now. Love that I can print anything even to older printers that are not wifi eligible! It's also great that my emails are directly in the app and i can save emails to look at later without having to search through all my other emails! Very happy with the app, totally recommend it! Excellent app that fills a real need. This app actually works with my two different printers! I can print from anywhere, it's great! Very convenient and fairly easy to use. Not working. After 20 mins to set it up I quit. You have been warned. Guess they need that 4.99 price more then I do. I wish I could talk to someone that could help me with my Canon Printer, or tell me where to look. Does everything it says Flawlessly!! I bought this because google said this was the best app for cloud print on iOS. It's really a sad app. Design is poor, functionality "kind of" works, all my prints come out blue, that is assuming it doesn't crash, and it's using web authentication which I have to enter my username password and 2 factor authentication every time I want to print. Would not recommend. Disappointed. I have a network printer and this app just works! Great app! I use it all the time to get stuff onto and off of my iPhone. It's not just for printing! And the couple times I've needed help, their tech support people were amazing. Very fast turn-around time, with accurate, helpful responses. Simple to set up, simple to use, and works every time. What more could I ask? I purchased this app so I could print some attachments from my email (gmail) when I'm checking on my phone. First of all, it's clunky to open my email and find the one I want. Second, app keeps crashing whenever I try to open the attachment. Lame, I want my money back. Great app! Does everything I want to do. I love this app it works great it is easy to use keep it up guys good work. I have tried over and over to use this with Google Cloud Print and it has never worked for me. I am very technical as well. The UI is really hard to navigate and for the output of the print never looked like the original document no matter what I did. If you are going to try to print with this app, I don’t recommend it. You are better off buying an AirPrint capable printer.